How can I submit an AIO story or script to Focus on the Family? How can I become an actor on AIO? Where can I get a list of the actors on AIO? Where can I get the album "Family Portraits" or "Odyssey USA"? What are "spoilers"? What is a "spoiler warning"? Where is Eugene? Where those scenes of him in "Plan B" and "Exit" pieced together from other shows? What happened to Will Ryan? Who is the Chairman? Should we have recognized his voice when he was heard in "Exit"? Is this webpage associated with Focus on the Family? How can I submit a review or correct information on AIOHQ? What is available at AIOHQ? What are some abbreviations used on this site? Could you post some more AIOs on RealAudio? How did you find out the air dates for episodes that aren't in the Complete Guide? What happened to the weekly AIO Quiz? Are you ever going to have another contest on AIOHQ? What inspired the AIOHQ? What's the "history" of this website? Just what do the two people who run the AIOHQ look like? Why are the years from 1987 to 1996 organized by year, but 1997 through the present are not? Do you have a webpage/any information on FOTF Radio Theatre? Can you listen to FOTF Radio Theatre on the web? See the Intro to Odyssey page. At this time, Adventures in Odyssey is not accepting unsolicited manuscripts. All writing is done by the on-staff writing team. A hiatus is defined as a "break". When applied to a television or radio series a "hiatus" is typically a time when a show does not produce programs or does not air for a time. Television programs usually take a hiatus during the summer, during which they produce no new programs and show only re-runs. When used for Adventures in Odyssey, "the hiatus" means the time from December 1996 to September 1997 where no episodes were produced. The writers, producers, actors, and production engineers needed a break from the daily pressure of the program and after ten years of production decided it was time. Many things have changed from "old Odyssey" before the hiatus to "new Odyssey" after the hiatus. None of the children (unless you count Rodney Rathbone) from old Odyssey have been carried over to new Odyssey. Nearly all of the storylines from old Odyssey were finished off in the final album of that era (Welcome Home) and the show has in general had a different "flavor" than before. There was also a hiatus from November 1998 to September 1999, though four new episodes aired in the spring of 1999. An "arc" is a series of shows that contributes to one particular plotline. All of the "continued" shows (Waylaid in the Windy City, Parts 1 and 2) are arcs, of course, but there are others throughout the series. Examples would include "A Tongue of Fire" and "A License to Drive" (since one leads into the other), "A Touch of Healing" and "Where is Thy Sting?" (since the second is the rest of the storyline), and "The Mortal Coil" and "Best Intentions" (since the second one is a follow-up of the first). Usually, however, when this website discusses arcs, they are the series of many episodes that contribute to one central message. Darkness Before Dawn and Welcome Home are examples of albums with large arcs in them. Currently, Odyssey is involved in an arc concerning Novacom Broadcasting, AREM, and many other players. The Complete Guide to AIO has a list of many of the actors in the back of the book. I currently do not have a complete list, but there is a section devoted to the major characters in the Voice Actors section. Note that some actors/actresses (most notably, the ones who play the Blackgaard twins and Katrina Shanks/Doris Rathbone) are not officially publicized. Currently these albums are not available from Focus on the Family and are incredibly difficult to find. There may be a few Christian bookstores that have copies out there somewhere, but it's rather doubtful after twelve years. There was a website that was offering copies of both albums, but these copies were illegal dubbed copies and Focus on the Family asked them to stop infringing on AIO's copyright. (By the way, if anyone out there does find either of these albums, I would keep it in good condition. It may well be a collector's item.) Focus on the Family has discussed re-releasing and/or re-airing these episodes, but hasn't decided yet. A "spoiler" is something that gives away a key plot point of an episode. I try to give a "spoiler warning" whenever I will discuss a plot point that could ruin someone's enjoyment of an episode. What happened to (insert favorite kid's name here)? Why aren't they on the show anymore? Unfortunately, kids have a habit of growing up and not sounding like kids anymore. When the voice actors who play the kid characters on Odyssey start sounding like teenagers, their characters generally disappear. (There have been several exceptions to this, most notably Jimmy and Donna Barclay and Jack Davis.) Other characters like Connie Kendall and Rodney Rathbone have been on the show for so many years because they are played by adults whose voices don't change. Most fans have noticed that Eugene hasn't been on the show in awhile. When he did appear in "Plan B" and "Exit," many of his lines were extracted from previous episodes. The official answer is that Will Ryan (the actor who plays Eugene) has been busy with other projects and "keep listening." Hopefully, we'll know more about Eugene soon. The Chairman is a new character. He wasn't heard in previous episodes and didn't represent the return of a character from the past. Simply e-mail us at nathan@aiohq.com. All reviews will be published on the site (after proof-reading and subject to approval by the webmaster) and corrections will be made as deemed necessary. Read my brief bio here. The site contains information and reviews on AIO episodes, books, videos, and other aspects of AIO. There is also a section on merchandise and places to discuss AIO with other fans. Click here to Tour the HQ. FP Family Portraits Waylaid "Waylaid in the Windy City"
I do not post the Real Audio AIO broadcast files. The posting is done by the sites on which they reside. I got these from the very helpful people at Focus on the Family. The weekly AIO Quiz ran for 20 weeks (from early February 1999 until late June 1999) on AIOHQ, but there were no real prizes. There were a lot of requests for a contest with real prizes. So, instead of a weekly contest, we decided to change to a monthly contest with the prizes of an AIO tape or an AIO album. We haven't had a contest in over two years, mainly due to the time they consume. We're considering several contest options, but we haven't decided on one. We'll let you know if we plan another contest. The primary inspiration for the website was my desire to "gather" all my opinions, reviews, and information about Adventures in Odyssey into one place. I first began working on the website on Christmas Eve, 1998. Until that point, I had never seen an AIO webpage (I hadn't done much looking). From that day until December 31, 1998, I worked on the basic structure of the site. The site then basically consisted of the year pages and the album pages. 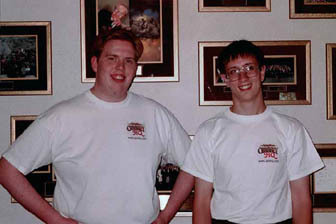 It was uploaded to the "old" toolcity.net site on January 1, 1999, but did not premiere at AIOHQ.com until February 1, 1999. Since then, there have not been any extremely major structure changes except the addition of the AIOHQ topbar. theforce.net ? For those who aren't Star Wars fans, this is just about the ultimate fansite. I was impressed by the dedication of the fans and contributors to the site and the hierarchical structure of the information there. IMDb.com ? The Internet Movie Database is one of the most incredible sites on the Internet. It contains an impressive amount of information on just about every movie ever made. It makes the best use of the web as a medium with its hyperlinks. These inspired the look and feel of many of my pages. vfxhq.com ? This page was the idea for not only many of my episode reviews and behind-the-scenes information, but also the name of the site. Among the other inspirations for the site are the AIO Complete Guide, Roger Ebert's movie reviews, Screen-It!, Asbury College's webpage (the topbar), Countingdown.com, and other sources. Starting in the fall of 1997 (after the 1997 hiatus), Adventures in Odyssey started the ?season? approach to episodes, similar to the way television shows operated. They had a ?bank? of new shows during the fall and spring and re-aired older programs during the summer. (You could argue that the show started to do this with the fall of 1996 and simply skipped the spring of 1997.) The shows are organized by season primarily because this grouping more reflects the shows the flavor of shows each ?season.? For example, the shows produced in the fall of 2000 were far different than those in the spring of 2000 because they were under a new "team." If the show ever discontinues the ?season? approach, AIOHQ will probably begin organizing strictly by years again. Do you have a webpage/any information on FOTF Radio Theatre? Can I listen to FOTF Radio Theatre on the web? A lot of people have been asking about Radio Theatre, so here's the latest news. It is airing weekly (on Saturdays) on around 90 radio stations throughout the country. They are hoping to expand to a larger audience soon. Click here for the Official Radio Theater page. Radio Theatre is written and produced by many Odyssey alumni, including Paul McCusker, Dave Arnold, and Mark Drury.